This article is about extra-terrestrial life as a theme. For other uses, see Alien invasion (disambiguation). Alien invasion from Mars, H. G. Wells' The War of the Worlds. The alien invasion or space invasion is a common feature in science fiction stories and film, in which extraterrestrials invade the Earth either to exterminate and supplant human life, enslave it under an intense state, harvest people for food, steal the planet's resources, or destroy the planet altogether. The invasion scenario has been used as an allegory for a protest against military hegemony and the societal ills of the time. H. G. Wells' novel The War of the Worlds extended the invasion literature that was already common when science fiction was first emerging as a genre. Prospects of invasion tended to vary with the state of current affairs, and current perceptions of threat. Alien invasion was a common metaphor in United States science fiction during the Cold War, illustrating the fears of foreign (e.g. Soviet Union) occupation and nuclear devastation of the American people. Examples of these stories include the short story The Liberation of Earth (1950) by William Tenn and the film The Invasion of the Body Snatchers (1956). In the invasion trope, fictional aliens contacting Earth tend to either observe (sometimes using experiments) or invade, rather than help the population of Earth acquire the capacity to participate in interplanetary affairs. There are some notable exceptions, such as the alien-initiated first-contact scenarios in The Day the Earth Stood Still (1951), Star Trek: First Contact (1996) and Arrival (2016). A trope of the peaceful first-contact is humanity attaining a key technological threshold (e.g. nuclear weapons and space travel in The Day the Earth Stood Still or faster-than-light travel in First Contact), justifying their initiation into a broader community of intelligent species. Technically, a human invasion of an alien species is also an alien invasion, as from the viewpoint of the aliens, humans are the aliens. Such stories are much rarer than stories about aliens attacking humans. Examples include the short story Sentry (1954) (in which the "aliens" described are, at the end, explained to be humans), the video game Phantasy Star II (1989), The Martian Chronicles by Ray Bradbury, the Imperium of Man in the Warhammer 40,000 universe, Invaders from Earth by Robert Silverberg, the movies Battle for Terra (2007), Planet 51 (2009), Avatar (2009) and Mars Needs Moms (2011). As well as being a subgenre of science fiction, these kinds of books can be considered a subgenre of invasion literature, which also includes fictional depictions of humans invaded by other humans (for example, a fictional invasion of England by a hostile France strongly influenced Wells' depiction of a Martian invasion). 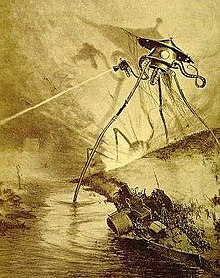 In 1898, H. G. Wells published The War of the Worlds, depicting the invasion of Victorian England by Martians equipped with advanced weaponry. It is now seen as the seminal alien invasion story and Wells is credited with establishing several extraterrestrial themes which were later greatly expanded by science fiction writers in the 20th Century, including first contact and war between planets and their differing species. However, there were stories of aliens and alien invasion prior to publication of The War of the Worlds. Voltaire's Micromégas (1752) includes two aliens, from Saturn and Sirius, who are of immense size and visit the Earth out of curiosity. Initially, they believe the planet is uninhabited, due to the difference in scale between them and human beings. When they discover the haughty Earth-centric views of Earth philosophers, they are very much amused by how important Earth beings think they are compared to actual titans such as themselves. In 1892, Robert Potter, an Australian clergyman, published The Germ Growers in London. It describes a covert invasion by aliens who take on the appearance of human beings and attempt to develop a virulent disease to assist in their plans for global conquest. It was not widely read, and consequently Wells' vastly more successful novel is generally credited as the seminal alien invasion story. Wells had already proposed another outcome for the alien invasion story in The War of the Worlds. When the Narrator meets the artilleryman the second time, the artilleryman imagines a future where humanity, hiding underground in sewers and tunnels, conducts a guerrila war, fighting against the Martians for generations to come, and eventually, after learning how to duplicate Martian weapon technology, destroys the invaders and takes back the Earth. Six weeks after publication of the novel, The Boston Post newspaper published another alien invasion story, an unauthorized sequel to The War of the Worlds, which turned the tables on the invaders. Edison's Conquest of Mars was written by Garrett P. Serviss, a now little-remembered writer, who described the famous inventor Thomas Edison leading a counterattack against the invaders on their home soil. Though this is actually a sequel to Fighters from Mars, a revised and unauthorised reprint of War of the Worlds, they both were first printed in the Boston Post in 1898. The War of the Worlds was reprinted in the United States in 1927, a year after the Golden Age of Science Fiction was created by Hugo Gernsback in Amazing Stories. John W. Campbell, another key editor of the era, and periodic short story writer, published several alien invasion stories in the 1930s. 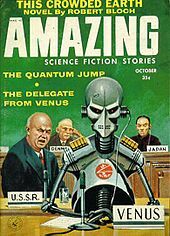 Many well-known science fiction writers were to follow, including Isaac Asimov, Arthur C. Clarke, Clifford Simak, plus Robert A. Heinlein who wrote The Puppet Masters in 1953. This is a familiar variation on the alien invasion theme. In the infiltration scenario, the invaders will typically take human form and can move freely throughout human society, even to the point of taking control of command positions. The purpose of this may either be to take over the entire world through infiltration (Invasion of the Body Snatchers), or as advanced scouts meant to "soften up" Earth in preparation for a full-scale invasion by the aliens' conventional military (First Wave). This type of invasion usually emphasizes common fears during the Cold War, with the Communist agents suspected everywhere, but has also become common during any time of social change and unrest. This theme has also been explored in fiction on the rare occasion. With this type of story, the invaders, in a kind of little grey/green man's burden, colonize the planet in an effort to spread their culture and "civilize" the indigenous "barbaric" inhabitants or secretly watch and aid earthlings saving them from themselves. The former theme shares many traits with hostile occupation fiction, but the invaders tend to view the occupied peoples as students or equals rather than subjects and slaves. The latter theme of secret watcher is a paternalistic/maternalistic theme. In this fiction, the aliens intervene in human affairs to prevent them from destroying themselves, such as Klaatu and Gort in The Day the Earth Stood Still warning the leaders of Earth to abandon their warlike ways and join other space-faring civilizations else that they will destroy themselves or be destroyed by their interstellar union. Other examples of a beneficial alien invasion are Gene Roddenberry's movie The Questor Tapes (1974) and his Star Trek episode "Assignment: Earth" (1968); Arthur C. Clarke's Childhood's End, the anime and novel series Crest of the Stars, the film Arrival (2016), and David Brin's Uplift series of books. The cult film They Live (1988) uses its own alien infiltration back story as a satire on Ronald Reagan's America and the 1980s as an era of conspicuous consumption, in which the hidden aliens and human members of the elite oppress poverty-stricken humans and a shrinking middle class. The beginning half of the popular video games Halo 2 and Halo 3 deals with the defense of Earth against a genocidal alien empire, the Covenant. The protagonist of the game along with Earth's military force, the UNSC, and a group of former Covenant who rebelled, the Covenant Separatists, eventually repel the invasion and topple the Covenant. The Mass Effect franchise features a race of massive semi-organic sentient starships called Reapers who destroy any civilization advanced enough to devise artificial intelligence, based on the perceived inevitability of it rebelling. In Orson Scott Card's series Ender's Game, an insectoid race of hiveminded aliens known as the Formics invade Earth on two different occasions, known as the First and Second Formic Wars. The first invasion resulted in very few casualties, but the second resulted in tens of millions of deaths. After this second invasion, the conglomerate of nations known as the International Fleet decided to launch their own invasion that would completely devastate the Formic home planet. ^ Kasavin, Greg (July 15, 2005). "The Greatest Games of All Time: Phantasy Star II". GameSpot. Retrieved 2010-09-13. ^ a b Flynn, John L. (2005). War of the Worlds: From Wells to Spielberg. Galactic Books. pp. 18–19. ISBN 0-9769400-0-0. ^ Guthke, Karl S. (1990). The Last Frontier: Imagining Other Worlds from the Copernican Revolution to Modern Fiction. Translated by Helen Atkins. Cornell University Press. pp. 301-304. ISBN 0-8014-1680-9. ^ Batchelor, John (1985). H.G. Wells. Cambridge University Press. p. 28. ISBN 0-521-27804-X. ^ Gerrold, David (2005). Glenn Yeffeth (ed.). "War of the Worlds". War of the Worlds: fresh perspectives on the H.G. Wells classic. BenBalla: 202–205. ISBN 978-1-932100-55-6. ^ Urbanski, Heather (2007). Plagues, Apocalypses and Bug-Eyed Monsters. McFarland. pp. 156–8. ISBN 0-7864-2916-X. ^ Peter, Lev (2006-11-06). Transforming the screen, 1950-1959. History of the American cinema. 7. University of California Press. p. 177. ISBN 0-520-24966-6. Invasion films were common in the 1950s featuring a variety of aliens portrayed as superior to earthlings both in intelligence and technology. In these films, aliens represent what some Americans feared about the Soviets. Invaders, friends or enemies, and often with the help of robots, either come to warn earthlings or destroy them with superior technology. Sometimes, the invaders use the strategy of infiltration, taking over the minds of the people, making slaves of them or appropriating their bodies, thus making war unnecessary. In some instances, the aliens already had a similar appearance - in Star Trek, while officially made contact with Humanity in 2063, (and were not "invaders" - some were shipwreck survivors, others time-travelers, accompanied by at least one Human, from a future where their respective worlds were allies) no fewer than six Vulcans had spent some time on Earth, passing as Human simply by using hair or skullcaps to conceal their pointed ears. ^ Parrinder, Patrick (2001). "Estranged Invaders: The War of the Worlds". Learning from Other Worlds: Estrangement, Cognition, and the Politics of Science Fiction. Duke University Press. p. 143. ISBN 0-8223-2773-2. ^ "Ender's Game". Publishers Weekly. Retrieved 2013-11-03.